I MAY HAVE FORGOTTEN THEM BEFORE, BUT THEY'LL BE BACK. AND THEY WILL HAVE THEIR REVENGE! Or, you know, be completely stationary on Justin's face. Because they're sideburns. 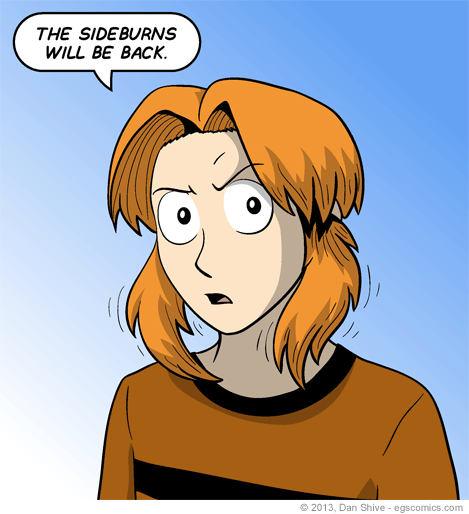 And it'll be by New Year's Eve in comic time because, you know, facial hair. It doesn't take him long to grow more. He could have a beard if he wanted to. I mean, he doesn't, neither literally or figuratively. Look, the point is that he's going to have sideburns again, alright? Yeesh.